Rotomolding materials are thermoplastics that are supplied as powder or pellets. First, the thermoplastic material is loaded into a mold that rotates on two axes. This hollow metal mold then moves into an oven and continues to rotate at low speeds. The walls of the rotomolded part are built as the plastic softens and coats the mold. Next, the mold moves into a cooling chamber. While continuing to rotate at a low speed, the tool is cooled by water mist or air. Finally, the rotomolded product or part is removed from the tooling. This plastics manufacturing process produces strong but hollow parts in a wide variety of shapes, sizes, textures and colors with features such as undercuts, multiple walls, and molded-in hardware and graphics. Part designers have a choice of rotomolding materials. For example, cross-linked PE is popular in fuel tanks. Vinyl and polycarbonate can also be rotationally molded. Four of the most popular rotomolding materials are LLDPE, HDPE, PP, and static-dissipative PE. The following sections describe their advantages and applications. LLDPE rotomolding uses linear low-density polyethylene (LLDPE), a durable plastic with good impact and puncture resistance along with high tensile strength. Applications for LLDPE rotational molding include plastic tanks, buckets, bins, toys, containers, and recreational equipment. The advantages of LLDPE include flexible designs, color matching, and custom colors. HDPE rotomolding uses high-density polyethylene, a strong, lightweight, and relatively inexpensive thermoplastic. HDPE rotational molding can support complex designs and large products, such as those used by food the food processing industry. Grades of HDPE are available that meet guidelines, standards, or requirements from the FDA and USDA. PP rotomolding uses polypropylene, a durable plastic with a high melting point that can withstand cold-temperature applications. This thermoplastic is resistant to stress, but slightly more prone to cracking than LLDPE. Rotational molding advantages with PP include how this plastic material won’t react with water, detergent, acids, or bases. Rotomolding with static-dissipative polyethylene (PE) is recommended for some electrical and electronic applications because this plastic material won’t generate a potentially hazardous electrical charge. Static-dissipative PE is also used with highly-sensitive electronics. Unlike anti-static materials, static-dissipative materials both reduce the risk of a charge and provide protection against existing charges. Which Rotomolding Materials Do You Need? Gregstrom Corporation is a plastic contract manufacturing company in Woburn, Massachusetts (USA) with over 70 years of experience. 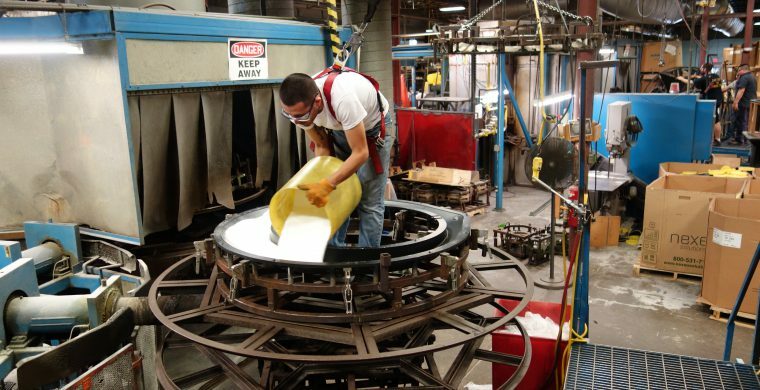 In addition to rotational molding services, our family-owned business provides design assistance and help with material selection. Gregstrom also offers value-added services like tooling, assembly and testing, quality assurance, finishing, and CNC and robotic routing. Would you like to learn more about rotational molding or rotomolding materials? Contact Gregstrom.